Imagine attending the party at which Violetta Valéry holds court with her admirers; seeing Giorgio Germont at close hand as he demands that Violetta give up her liaison with his son; or joining the young Alfredo Germont as he rushes to his ailing lover’s side. That is the experience that Musica a Palazzo offers audiences who come to its presentation of La Traviata. Set in the opulent surroundings of the Palazzo Barbarigo Minotto in the centre of Venice, Musica a Palazzo’s interpretation of what is arguably Giuseppe Verdi’s greatest work uses the rooms of the palace instead of a stage. The drama of the opera comes alive because the audience feels as if it is part of the action. It was in Venice that La Traviata was first performed, on 6 March 1853 at the Gran Teatro La Fenice, making the connection between the work and the city more intimate still. The central hall of the Palazzo, the Portego, hosts our first encounter with Violetta and the scene in which Alfredo falls for her. The seemingly private setting of the Sala Tiepolo allows us to witness Violetta’s heartache up close as we see her torn between her feelings for Alfredo and the choice she must make to protect the honour of his family. Finally, the audience moves to the Palazzo’s Camera da letto (the bedroom with an alcove) permitting us to join Alfredo and Violetta in one of the saddest scenes in opera, one that sees the two lovers reunited only for Violetta to be overwhelmed by her illness. 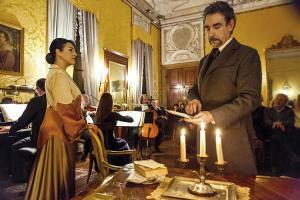 What would Verdi have made of Musica a Palazzo’s La Traviata? It is a fair guess that he would have enjoyed it as much as audiences do today. In La Traviata, Verdi searched for an honesty that was denied to him by the Venetian censor. Rather than being given the opportunity to present the world as he saw it, Verdi was forced to locate the action in the distant early eighteenth century. The authorities feared that La Traviata, in a contemporary setting, would scandalise society. By placing its performance in the composer’s times, Musica a Palazzo’s production is La Traviata Verdi himself wished for, but never saw in his own lifetime.